No matter where you are in your career you want a role that’s fulfilling and hopefully you also want to be inspired and challenged (most of us do). You also want to work for a company that eagerly supports your professional development. How do you fulfill your dreams and aspirations – especially in this big world? How do you learn about the things you don’t even know exist? How do you keep yourself motivated in the work you are doing now when all you feel like you do is push push push? A mentor is a powerful way for you to invest in your professional growth and personal fulfillment. Perhaps the company you work for has a formal mentoring program – that is great; if you can get into them formal mentoring programs help match you with a company mentor. If your company doesn’t have a formal program you will have to find a mentor outside of your company (I suggest you find one outside your company even if you do have a formal company program). How do you choose a mentor? Here are 4 quick explanations on how to find a mentor (or two), to help you answer questions and navigate your career. Step 1. What Do You Want To Learn? To get better at what you do now? If so, think about people who do similar work as you. To learn about other opportunities? If so, think about people who do work you think you might like. A good mentor can be a great sounding board… or devil’s advocate. Look around for a mentor prospect and explore mentor qualities. Is there someone you know who you admire (either in the company or not)? Is there someone you have heard of that you would like to learn from? Perhaps you are looking for someone who will share your passion for social justice. Does your mentor prospect have a similar personality as you do? I recommend exploring their values and make sure they are similar to your own. What motivates them? The quality of your mentors is really important because you have to trust what they say… and likely… their discretion. Before you both commit, get to know each other. Being well matched is important because you have to trust them and believe their advice is sound. Your mentor will have some influence on your future viewpoints, beliefs and behaviours. That said, I recommend you don’t choose someone who has the same background, history and lifestyle as you. I believe a great mentor is someone who has different life experiences and/or a different personality than you; perhaps they come from a different cultural background, perhaps a different industry, perhaps they are more creative. For example, if you are naturally cautious and reserved, a mentor who is a bit more aggressive may be helpful for you… that you can rely on. Equally, if you jump first ask questions later, a mentor who is more thoughtful and reflective may be a nice fit. You may want to meet regularly with a successful person outside of your industry because their ‘fresh eyes’ into your world may provide amazing insight. You may want a mentor you can use for 911 emergency calls; someone who you can ask a specific question, get their honest opinion and then hang up. This is a bit unusual, but still highly valuable. Being a mentor or having a mentor doesn’t have to be complicated, expensive or formal. It can be as simple as agreeing to go for coffee once or twice a month and perhaps also being on-call if you suddenly have an emergency or a major question. Ask your prospect mentor for a casual coffee or lunch. This is the time for each of you to evaluate the other. Let them know you admire them and are looking for a mentor and would like them to consider being that person. Share you expectations and abilities. If they seem interested but don’t really have the time you were hoping for (so put them on call for emergency situations). If you both agree to move forward, my recommendation is to keep your meetings somewhat informal… but have at least one preferred outcome per meeting. It’s likely you are both going to be busy, so allow some flexibility. I find phone meetings surprisingly helpful and efficient… I didn’t expect that at the start. I thought they would feel cold and impersonal. That said – I also recommend getting together fact-to-face from time to time. As the song goes, “You got to know when to hold ’em, Know when to fold ’em” (my dad would be so proud). At some point your mentor and you may decide to part… or you both may become best friends. Either way – be fully present. Don’t hold on longer than you should… it may be that you’ve done as much as you can together and now it’s time for them to help someone else. If you part ways don’t think that should be the end. Be on the lookout for your next mentor, you are never too experienced – you can always benefit from good advice. It also may be time for you to mentor someone and give back. Being a mentor can be as helpful as having a mentor. One of the great motivators for Millennials at work is when they can help / coach / mentor one of their associates. This helps build their leadership skills and will also likely increase their loyalty to your company (for a year or two longer). People love to help other people. It helps them feel fulfilled. It’s how you ask and what you expect from them that will impact your success. Still, you have to mind your manners. After each meeting send a thank you note. Mentors have wisdom and share experiences. To me, that’s what mentorship is: drawing from that wisdom and potentially learning from their successes. We hope you enjoyed this post. Happy mentoring and climbing the corporate ladder everyone. As a leader you have spent years proving what you believe in. You have spent a lot of time seeing the future, and you have realised your vision by supporting your team; by stretching them, encouraging, empowering them and by motivating them… not by forcing them. Your vision has given others clarity, it’s been a trusted guiding light for your team. You’ve helped your team be amazing – perhaps even surprise themselves. As a leader you’ve helped them demonstrate what they are made of… to expand their skills, experience and confidence. Your optimism has made a difference. You bring people with different ideas, needs, beliefs together. You support the people around you to show they are of people of compassion, empathy, talent, collaboration… that they make each other better… that whatever they work it is better when they work together… taking advantage of each others unique talents and perspective. As a leader you give the people you support the courage to make decisions and to learn from their mistakes. You give them the courage to do the things that are right for themselves and the organization. You help them understand the company values and encourage them to use those values with every decision they make and every action they take… and most of all… you lead by example. Your focus has benefited everyone around you. You’ve made change – mostly for the better. You’ve also made a few mistakes… but instead of hiding from mistakes you chose to learn from them. You show people it’s important to show everyone compassion – including yourself. And from your big role as a great leader you have built a reputation as a passionate visionary, a supporter of values, trust, virtue and most importantly… a supporter of people. You do what is right, not what is easy. You ignite passion. You make a difference! Now It Is Time You Move On. You feel the time has come for your next adventure – it is time you move on. But, you are holding yourself back. Leaving a role where you have made a big difference can feel like letting people down. You don’t want to disappoint the people around you. And you still see so much untapped potential in many of the people you support… if you could just help them a little longer. As a leader you also see there are goals you have not accomplished. You might realize there is something you’ve wanted to do for years. You might discover there something you passionately want to learn… like cooking. You may decide to finally fulfill your dream to get more formal education. There may be someone you’ve always wanted to meet (and perhaps work with), but they don’t even know you exist. Now is the time to call them and ask them to lunch; I bet they go. It is time for you to get creative about what you want for you – what will fulfill you? What will make you and your family happy? What do you need when it comes to work/life balance? Whatever your next step is, it’s going to be a new challenge that will push you outside of your comfort zone (I hope). You will have to push yourself similarly to how you have pushed / supported others. You will grow… like you have helped others grow. As an executive coach I encourage you to give yourself up to the unknown and the pending learning curve. I also encourage you to find a new mentor (perhaps), to help you experience the changes you will be encountering. One last idea. Because you have been such an amazing leader, your team and your customers may not want to let you go. Help them. This is another new learning curve for them – a way for them to grow… to change… to use the maturity you taught them to feel vulnerable but still embrace new opportunities with courage and an open mind. This will be difficult, but you have to give them the confidence and the momentum to move away from you. Remind them to continue to be kind to each other, to support each other and to trust each other. Help them support their new leader. Tell them how proud you are of them. Remind them how much they have grown. Then, tell them to ‘get on with it‘ (as my dad would say). Let change be liberating for you. Find a space to be creative. It is time. There will always be goals to realize and people to help. But now is the time to let go – don’t worry about what you didn’t accomplish – let someone else realize those plans (if they were truly meant to be). Perhaps the employees you’ve help need you to leave so they can continue to grow. Maybe they need to take on more responsibility. And, maybe instead of their leader you can still support them by becoming their mentor. Leaving a role you love is not disappointment, it’s an adventure… an opportunity for you and for the people you work to continue to grow. So, go! Get outside your comfort zone. We hope you enjoyed this post. Happy communicating everyone. When we think of great leaders we think of people who have leadership qualities like goal setting, inspiration, dedication, honesty, trustworthiness and so many other positive qualities. Millennials on the other hand are often described as lazy, entitled, selfish and many more negative… descriptions. However, when the right Millennial is hired for the right job these descriptions are not valid… especially when they are mentored by a great leader. You studied / read leadership books. You paid attention to good and bad examples of leadership. Very few people are natural-born leaders. Lets not cast aside Millennials as hopeless. Instead, lets intentionally teach / mentor Millennials how to be great leaders. When you have the right person in the right job, Millennials (like most people) are self-motivated and full of potential. So it’s up to their parents, professors, HR professionals and managers to make sure they are demonstrating the best leadership qualities for today’s ever-changing business market. The challenge for them is to not learn poor leadership styles some of us have had to un-learn from that one really bad boss we once had. You know, the boss who had the Top-down / Carrot-Stick leadership style poplar post WWII when jobs were linear, repetitive and boring. The reality is that today most jobs are far from linear, repetitive and boring. using – and teach Millennials how to be leaders? Here is a list of 6 important lessons that will help teach Millennials how to be leaders. Most Millennials have wonderful values like compassion, charity/philanthropy, creativity, collaboration and achievement… and are not usually strong on values like conformity and tradition. Learning to recognize their strengths and values… and the strengths and values of others (and the organization), is critical to them being a great leader. Help your Millennials by teaching them the importance of values when making decisions and communicating. When the time comes for your organization to review your mission, vision and values, let all of your employees contribute to your mission, vision and value statements. Demonstrate that great leaders make sure everyone have a respectful opportunity to contribute. The best leaders are effective because they know what they are best at and they lead with those skills. To create effective millennial leaders we must help them first understand their own gifts and talents. Help them identify what these skills are so they can use them to make informed decisions. Help them also see their gaps not as failures – but as opportunities to rely on (and develop), other people. Authenticity and fairness come naturally to most Millennials. They grew up being encouraged to explore their individuality and to accept others for who they are no matter of their differences. As their leader, demonstrate that being authentic and transparent is important in their professional life. Show Millennials that what they say and what they do matters and will be respected – especially in difficult times or during difficult conversations. Autonomy ranks very high on a Millennials list. Sure they love working in teams and are some of the best / least territorial collaborators… and yet, like most of us, Millennials love some independence. Trusting individuals to control their schedule is important. They will also enjoy when their collaboration team enjoys some project autonomy. By trusting Millennials (and other generations), you deepen commitment by demonstrating your respect for them and their opinions / talents. Being confident about goals and objectives is terrific – but being flexible is also advantageous. Great leaders know that other people’s ideas and experiences often bring an approach and creativity that wasn’t previously considered and may make the project even better. This also supports your plan to offer employees more autonomy. Millennials love to learn – so remind them they can’t learn while they’re talking… only when they’re listening. Great leaders understand how powerful listening is in building relationships and respect. Teach your Millennials not just to listen, but to demonstrate they are listening and care about what they hear. Like any good news reporter, encourage them to ask powerful questions… and to listen to the response. Millennials have the ability to become great leaders. We just need to teach them to recognize and lead from their innate strengths, communicate effectively, listen well and be transparent in what they do. Start today and lets awaken the leaders of tomorrow! Happy communicating, mentoring, motivating… and training. Boomers want to stay relevant and current – and also want more flexibility to enjoy their families and everything they’ve worked hard for. Gen Xers want to make their mark and drive change while also keeping focused on their families and work/life balance. Millennials (Generation Y) have entered the workforce and four of the many things they value are continuous learning, wanting work that’s meaningful, wanting to feel a sense of accomplishment and they want autonomy. So in general, it’s fair to say that employees (even Boomers and Gen Xers), want to do work they feel passionate about. And this is a good thing… but requires us to learn how to manage and motivate employees (and ourselves), differently. And yet, many Boomers (still the largest group of Business Owners / Executives / Managers), have a challenge managing and motivating their employees – especially Millennials at work. For example, they give Millennials a job AND pay them… and wonder why they quickly become bored, want more and/or leave. Times have changed and Millennials and the emerging Gen Z are going to keep us moving forward. Millennials at work do want more… and so do most employees of all ages. The one thing to remember is that we all excel when we do work we are interested in. That’s the key. We all excel when we do work we are interested in. It’s like when we start a new job – we are excited – we are learning new things and meeting new people – we are creative – we ask questions – we even innovate… and then we get bored. The same happens with Millennials except their timeline is usually in months not years. So, how to do managers keep ALL employees of different generations excited? They have to motivate and mentor employees differently – and more specifically, they need to reward differently. Here’s the thing… traditional reward and recognition systems are salary based with (hopefully), a raise and/or bonus every 12 months. Unfortunately money doesn’t motivate today’s employees for long. Traditional reward systems (salary / bonuses), assume that work is not inherently enjoyable; and 30 years ago most work wasn’t. But our work has changed in the Digital Age and we’ve all changed… we want to enjoy our work. C – Competence / Mastery… learning new things – gaining experience and/or using an expertise. Studies have proven that external rewards like traditional salary / bonuses, can have negative impact on problem solving and creativity (as two examples). Why? Because employees soon learn to expect the ‘reward’ and often become unmotivated if/when they don’t receive the ‘reward’ when they expect it. Alternatively, employees who feel passionate about their work and who feel supported by the low/no-cost C.A.R.P. motivation and reward systems will almost always become creative, higher-than-average performers. In addition, when employees feel proud and excited about their accomplishments they demonstrate greater organizational loyalty and think twice before leaving. And, feeling proud and excited happens all the time – not once every 12 months. In this busy, fast-paced work environment it’s important employers have confidence in their employees talent and give them enough autonomy to do their work and be proud of what they accomplish. Watching every move – double-checking every task is an ‘old-school’ way to motivate and mentor employees and will only slow down progress / productivity and make talented employees feel less professional and personal influence. In addition, traditional motivation and mentoring systems will cost more both in money (salaries / bonuses), as well as the cost to replace unmotivated employees who quit after only a few months – or years. How do you feel? Do you believe your emotions and actions affect employee engagement? Traditionally, showing your emotions at work was considered unprofessional. Thankfully things are changing and because of this so is the potential for increased employee engagement and productivity. Everyday more research comes out that demonstrates emotions like emotional empathy and compassion are powerful assets… not liabilities. 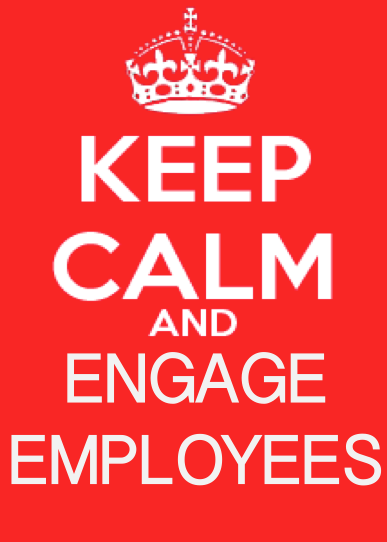 How Does Employee Engagement Happen? Employees may start off as keen or driven… but they remain engaged because the organization and their leaders/mentors create a safe, encouraging space that helps them use and develop their core competencies. One of the primary responsibilities of a leader/mentor is to manage the emotional well-being, energy and motivation of their employees. Leaders/mentors also remind employees of the company mission, vision and values which helps them stay focused and make productive, smart decisions (which is especially important for Gen Z and Millennials). Clearly, emotional intelligence (EI), plays a huge part creating the leadership and infrastructure that will support employee engagement. This also means that all levels of an organization are required to teach, support and reward employee engagement (Top down & Bottom up). Leaders are valuable when they increased productivity, revenue and brand while decreasing or maintaining costs. The best way to do this is to hire and keep the best employees and help them deliver their best work. Demonstrating emotional intelligence (EI) means recognizing, understanding and managing your emotions, and therefore [positively] impacting, encouraging and empowering the people around you. Happy communicating and employee engagement.